We’ve collected tips and advice from successful researchers, here’s what they say is important to consider in your Experiment campaign. Remember, at its core, crowdfunding is as much about raising funds as it is about science communication and public engagement. Building your community doesn’t happen overnight, but rather step by step. Follow this checklist to create a presence through sharing interesting content pertaining to your research! Don’t be discouraged if it’s slow the first time around, there’s a reason that this is new! Creating a storyboard is an important tool for preparation. It helps you to identify what your message is and how you'll convey it. Crowdfunding campaigns are never fully funded by chance. You will need to have a plan in place, especially for great content that you can use as ammunition to get eyeballs on your page. The more prepared you are, the more fun the experience will be. And of course, prepare to be adaptable as your campaign can always take a life of it’s own. Crowdfunding relies on a relationship of trust. In your video and/or researcher bio, don’t be afraid to add a personal touch to it. They want to know as much about the idea as they do the people behind them. Show that you’re a qualified expert, and then share something cool about yourself. At the end of the day, crowdfunding requires you to be a good story teller. What makes a good story? Fans and followers enjoy seeing progress. Even if you aren’t sure what your message is or where the story is going, keeping people in the loop with regular and short updates is a great way to let a story develop. It’s a good way to stay on peoples’ radars, especially bloggers and journalists. Your initial community will be the foundation of your campaign. Don’t be shy in reaching out to friends, family and research colleagues, to explain the importance of your research. What you’re doing is important, and moves the needle in science! This can be done on a personal level with direct messages, tweets, or emails. A good rule of thumb is that 80% of campaigns succeed if they can hit 20% of their target. Try securing commitments for the 20% before the campaign begins to give yourself the best chance! The first time you ask your networks to fund the campaign will work, but it probably won’t work the second, third, or forth time, especially if nothing new has happened! Instead of asking people to directly pitch in, try asking or inviting folks to help with the outreach. Ask your friends who they think would like the project. Try sparking a conversation for questions about the project or a discussion about the larger implications. Remember, backers are people who have supported your project to learn more about your important research. Engage them through lab notes (tips here on creating them). Make them feel like they are part of the research experience and making a difference. It’s never just about the money. It really shows if you’re passionate and enjoying the work, so let it show. This is a chance for you to communicate your research with real people who in some way, share your passion. An endorsement from a respected researcher in your field lends additional credibility to your work. On your Project Dashboard, you will find a button to send endorsement requests under "Settings". Importance: Why do weneedto answer this scientific question now? Novelty: Has this question been answered? Has it been attempted? Impact: What’s the risk, and what's the potential upside? Design: Is the design of the experiment sound? Qualifications: What makes this researcher uniquely qualified? In the example above, Dr. Allen explains why the project that Brian (the researcher) is proposing is critical, timely, and novel. He also explains his relationship with Brian. For more examples, see our Requesting endorsements section. You can learn more about how endorsements fit into our scientific review process here. If you've been invited to write an endorsement and you have general questions about Experiment, don't hesitate to contact us. A press release is a valuable tool for getting your story heard. It’s a short one-page summary, sometimes with photos included, detailing in very plain terms the relevant event or story. If you have contacts or certain news outlets you want to reach, then it’s very common to also send along an attached press release. Social media can be really great tool for communicating with your existing network, and also to grow your community. Effective social media strategies start with having unique content (i.e. labnotes, images, and videos), which, when delivered to a targeted audience, brings eyeballs to your project page. Twitter is an open communication platform. This makes it a great place for scientists to start conversations and share their content with people outside of their initial network. Twitter also provides native analytics that allow you to see what works, and to inform changes. Tweet often. The life of a tweet is short. It's estimated that only 25% of your followers will see any given tweet. Don’t be afraid to tweet often. Some researchers even pre-schedule tweets through social media management tools like Buffer, and Hootsuite. Variety of tweets. You can construct tweets for a variety of different purposes. Your copy should be tailored towards the goal. Are you starting a conversation? Sharing content? Asking for a re-tweet? Mix it up to keep it fresh. Not every tweet has to be about getting funding. Use hashtags. Adding related keywords as #hashtags (no more than 2 or 3) can increase the visibility of your tweet. For example, if your research project is about air pollution, you might consider using the hashtags #pollution, #green, or #sustainability. This will help your tweet show up when people are filtering for tweets by these keywords. Tweet at influencers. Mention influencers by sending a tweet with their Twitter handle. Influencers range from those with mega followings (Bill Nye) to subject matter experts/advocates to those local to your community. Your outreach strategy should have a mix of influencers, and focus on sharing original content, and by starting conversations. Include pictures. Pictures increase the visibility of your tweets, and generally improves clickthrough rates for any links. Send personal Facebook messages. Sending messages to your friends’ inboxes is perhaps the most effective method of using Facebook to grow your community. Don’t be afraid to ask your friends for their support – large or small, financial or social. Post on your wall. This may seem obvious but it's an important one. Share the link to your project on your Facebook page, and encourage your friends to share it on their pages as well. Facebook loves positive news; keep your network updated when you reach major milestones like 50, 75, and 100%. Also be sure to alert them as your campaign approaches its final days. People are more likely to back when there’s a sense of urgency. Post in Facebook groups. Use Facebook's search bar to find Facebook groups related to the topic of your research. You may have to request to join some of these groups at first, but most admins will let you in if you seem credible. Facebook groups are a great way to find strangers that unite around a cause. Host an event: Host an offline talk or event explaining your work and the importance of supporting the research. Posting to Reddit has been immensely helpful for a handful of Experiment projects. Reddit can be a very particular audience, but if you think the Reddit community might like what you’re working on, then it's worth sharing your science there. Submit a link to Reddit. The tagline is everything, so come up with something witty or attention-grabbing! Conduct an AMA (Ask Me Anything). This is recommended for people who have some experience with using Reddit already. See this great AMA example by Kathleen Pryer for her Azolla project, which was voted to the front page of Reddit. If you're interested in trying out an AMA, check out Reddit's AMA guide for how to submit. Descriptive subject line: Make sure your subject line is not too generic, and includes just enough detail to pique the attention of the recipient. Send personal e-mails. Or group send e-mail. If your project reaches the first funding goal and you still have days remaining in the campaign, you will have the ability to add stretch goals through your Budget section. The budget items that you add should allow you to complete another portion of the research project. 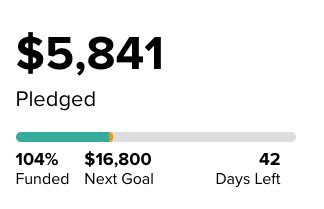 We don’t allow stretch goals for generic funds, so be as specific as possible. You do not need to reach your stretch goal to receive the funds beyond your first funding goal. You must reach the first funding goal to receive the project funds. Anything you raise beyond the first funding goal is yours to keep, after taking into account platform fees. If your project reaches its fundraising goal, you are going to get paid! When the campaign ends, we'll charge your backers' credit cards. This process takes a few days, and you'll be able to view the status of each pledge in your project dashboard. We can send the funds to you or to an instutution (e.g. university or research organization) via the method you specify in your payout info form. United States: ACH transfer or check. Canada, Australia, UK: ACH transfer only. All other countries are required to fill out this short questionnaire to apply to our pilot program. We will contact you about information we need for payout. If accepted for our pilot and your project is successfully funded we will payout the funds using Paypal. Paypal payouts are subject to an additional $30 fee. If your project is successfully funded, Experiment charges a 8% platform fee and our payment processor charges an additional fee of roughly 3-5%. The payment processor charges 2.9% + $0.30 on each successful charge. See the payment processing fees here. Fees will be deducted from your total payout. At the payout stage there is no additional fee for ACH transfers to our supported countries (United States, UK, Australia). For check payouts there is an additional $20 fee. For payouts in unsupported countries, we only support payout through Paypal. There is an additional $30 fee for Paypal payouts. If your project is not successfully funded, there will be no fees. Sometimes payments will be declined, usually due to a credit card error. When a pledge fails, the backers are repeatedly notified to update their payment information. However, we cannot guarantee that all pledges will be collected, which may affect your payout amount. Right now, we only accept pledges from backers in USD. If your bank account is in Canada, Australia or the UK, our payment processor will do a currency conversion into your local currency. We plan to support pledges in other currencies soon. The most common payout method is for funds to be sent directly to a project's affiliated institution. These funds are distributed as a single restricted gift directly from Experiment. The payout is sent as an award, and is one-time in nature and does not carry any additional reporting requirements to Experiment. Experiment's payout policy does not allow for any institutional overhead to be taken on awards. If tax deductibility is a priority, you must set up tax-deductibility before your project launches. For context, 99% of projects are not tax-deductible. Affiliated institutions with registered 501(c)(3) status in the United States qualify. A tax-deductibility badge will be displayed on the project page, and the project will be listed on our tax-deductible page. To set this up, contact our partnerships team for instructions. We can also send funds directly to an individual. In general, funds raised on Experiment are not subject to taxes – as contributions to projects usually qualify as IRS-defined gifts. For further information, we highly recommend talking to a tax advisor, and further exploring the IRS guidance on gifts. For projects that involve human subjects, we require the research team have an Institutional Review Board, IRB, approval prior to the launch of the campaign. An IRB is an administrative body established to protect the rights and welfare of human research subjects that are recruited to participate in the study. We do not yet offer an IRB as a service. To run a study involving human subjects subjects, you must recieve IRB approval from a research institution. For projects that involve vertebrate organisms, we require the research team have an Institutional Animal Care and Use Committee, IACUC, approval prior to the lanch of the campaign. An IACUC is an administrative body established to protect the rights and welvare of vertebrate organisms used in the research study. We do not yet offer an IACUC as a service. To run a study involving vertebrate subjects, you must recieve IACUC approval from a research institution. To verify ethics committee approval, we look for a posted lab note with evidence that the project methods are approved by the ethics committee. An official letter from the committee uploaded as an image to the lab note displayed publicly satisfies our ethics requirement.